[dotTech Giveaway] 5 free copies of Warhammer 40,000: Space Marine! Earlier this week dotTech reviewed Warhammer 40,000: Space Marine . In the review we promised we would be giving away copies of the game for free. Well here we are. 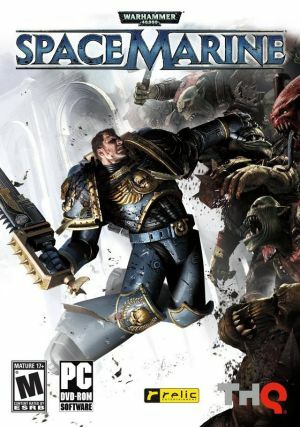 Thanks to IntKeys , a Swiss-based online retailer of video games that sells games at highly discounted prices, dotTech has five copies of Warhammer 40,000: Space Marine to give away for free! Before I go into the details of this giveaway, since IntKeys is the sponsor for this particular giveaway it is only fair we give them a little plug. As already mentioned, IntKeys is a Switzerland-based company that sells computer video games online at highly discounted prices, e.g. they are selling Rage for $34.99 [regular price is $59.99]. You may be wondering how they do this. It works like this. First and foremost you purchase legitimate copies of games from them, but they only provide you with the relevant CD key for the game as opposed to shipping you the game box and actual CD. This cuts down on costs. Secondly, and more importantly, IntKeys utilizes the different region prices to their advantage. You may or may not know this, but different regions in the world have different pricing for games. For example, a game in the USA may cost $59.99 but the exact same game may cost $29.99 in Russia. Both are legitimate copies; the different prices result from price discrimination practiced by game producers to earn higher profits. IntKeys buys games from regions in which they cost less and sells them at a discounted price online. So, sticking with the example we already have, IntKeys may buy the game from Russia for $29.99 then sell it online for $39.99. They earn $10 on the sale and customers save $20 off retail price. A win-win, no? Visit IntKeys.com  if you are interested to learn more. If you end up purchasing, be sure to use the coupon code a45dottech4 for an additional 5% off. We are giving away Steampowered copies of Warhammer 40,000: Space Marine. So you must have a Steam account to take part in this giveaway and you must make sure your computer can run Steam . If you don’t have a Steam account already, you can easily make one. Steam accounts are free. Warhammer 40,000: Space Marine is rated M, for Mature. By entering this giveaway you agree that you are legally old enough to play this game in the country/region you live in. For the United States you must be 17 years or older. dotTech is not responsible if you lie about your age. By entering this giveaway you are giving dotTech permission to contact you via e-mail. We will only use your e-mail adress to deliver the CD key for Warhammer 40,000: Space Marine to you, if you win. We won’t spam or sell your e-mail address. Everyone may enter this giveaway only once and win only one copy of Warhammer 40,000: Space Marine. Anyone trying to enter more than once and/or trying to win more than one copy will be 1) disqualified and 2) be hunted down like a dog by my squad of monkey ninja warriors. Do you purchase games online? If yes, then please state how often and what type of games. If you do not post a comment below and answer all three questions, you will be disqualified from this giveaway. When posting a comment, please make sure you enter an e-mail that is 100% valid and an e-mail you will check because the licenses will be distributed via e-mail by me. However, please don’t post your e-mail in your comment! You should never post your e-mail on a public forum. Just enter the e-mail you want to be contacted at in the “E-mail” field when writing your comment – I will be able to get your e-mail from there. Or if you are a registered dotTechie, just post a comment while you are logged in and I will be able to find your e-mail. If you are a winner I will send you a verification e-mail to confirm your e-mail address is valid. You will need to reply to that e-mail after which I will send you your CD key. You must reply to the verification e-mail to get your free copy of Warhammer 40,000: Space Marine. If you do not reply to the verification e-mail within 48-hours, a different winner will be picked in your place. This giveaway is open until Friday October 7, 2011 11:59 PM Pacific Standard Time. The five winners will be picked randomly after the entry window has closed. Good luck to everyone!